Kasrod vegetable is a very famous Jammu delicacy which is usually made in Dogri homes. 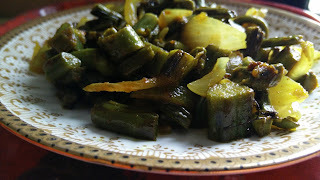 It is a dry vegetable which can be eaten with chapatti or paratha or bread. It is a very simple recipe but needs little preparation to wash, blanch and dry the kasrod. Pre –preparation of Kasrod – Shave off the skin of the kasrod with light hands. Cut into small pcs and then blanch then in boiling water with little turmeric powder. Once blanched wash the pcs atleast 3-4 times to remove the dirt. Then spread the kasrod pcs to dry off. Once dried, heat oil in a Kadai and put kasrod pcs in heated oil. Add all the spices and sauté for few min. Add onions and cook for another 5 min till kasrod is soft and tender. Serve hot with chapatti or bread.